Guide Dogs and Hearing Dogs for Deaf People are marking Deafblind Awareness Week (June 23-29) by celebrating 10 years of working together to produce 25 very special assistance dog partnerships. Over the last decade the charities have collaborated to train 25 dog partnerships for people with combined sight and hearing loss. Lee Stanway from Guide Dogs said: “Guide Dogs is world famous for helping people with sight loss, but some of our clients also have additional needs which presents an even greater challenge for someone wishing toget out and about on their own terms. Angie Platten, Head of Partnership Services from Hearing Dogs for Deaf People said: “Hearing dogs are trained to respond to important sounds and danger signals, and help to alleviate the isolation and loneliness that deafness so often brings. Deafblind Awareness Week aims to raise awareness and understanding of deafblindness and the challenges that people with sight and hearing loss face on a daily basis. 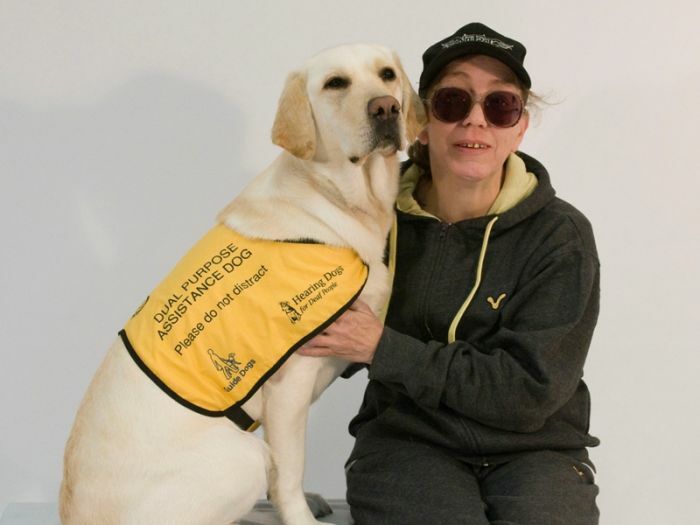 Angela Hassall was the first person in the UK to have a dual-trained guide and hearing dog ten years ago. Roddy retired in 2011 and is currently enjoying life with Angela’s daughter Sarah. Angela now has another dual-trained Lab/retriever cross Mel to help her get out and about. Be the first to comment on "Deafblind Awareness Week marks milestone for Guide Dogs and Hearing Dogs for Deaf People"